HSUS vs. abolitionists vs. the meat industry: Why the infighting should stop. Animal rights activists would accomplish a lot more if they stopped attacking the Humane Society. The “abolitionist” wing of the animal rights movement has criticized the Humane Society of the United States over its policies on pigs and other farm animals. Such assessments are music to the ears of Paul Shapiro, vice president of farm animal protection at HSUS. Shapiro spends his days lobbying for costly reforms that would eliminate inhumane methods of animal confinement. As Shapiro sees it, industry blowback is to be expected and, in a way, even welcomed as an affirmation of his advocacy. It’s always nice to know when your arrow hits the intended target. Less expected, and certainly not welcomed, is the barrage of criticism that comes from the “abolitionist” wing of the animal rights movement, which views HSUS welfare reforms as craven capitulation to industrial agriculture. The rift dividing HSUS from this vocal wing of the animal rights movement might seem insignificant, but it’s not. In fact, it threatens to weaken the cause from within, a phenomenon all too familiar in the history of American reform movements. And mending the rift will be no mean task, as it requires confronting a thorny question: Does HSUS, in its ceaseless quest to improve living conditions for animals within factory farms, justify and perpetuate the ongoing existence of those farms? There is little doubt that HSUS is doing something right. 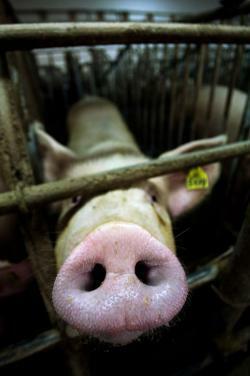 A complete citation of their recent accomplishments would be too long to list here, but consider that in one week alone last July, HSUS persuaded Sodexo, Oscar Mayer, Hardee’s, Carl’s Jr., and Baja Fresh to eliminate the use of gestation crates, cages that confine pregnant pigs so tightly they cannot turn around. In banning this torture device from their supply chains, these companies joined industry kingpins McDonald’s and Smithfield Foods in yielding to Shapiro’s ceaseless nagging on behalf of a barnyard proletariat numbering in the billions. Nevertheless, as the abolitionists correctly point out, there’s nothing especially revolutionary about HSUS’s approach to improving the lives of farm animals. HSUS works closely with Big Agriculture, never calls for animal liberation, and never explicitly endorses the habit that most efficiently prevents animals from being killed: veganism. This reticence infuriates abolitionists, who seek the eradication of not only animal agriculture but also all animal ownership and exploitation through ethical veganism. Francione’s logic is hard-hitting, but his extreme message is unlikely to resonate widely in a population that’s only 1.4 percent vegan. According to social psychologist and longtime vegan Melanie Joy, the abolitionist approach could attract a lot more supporters if it acknowledged, as HSUS does, that most people are going to embrace veganism on their own—you can’t strong-arm them into it. Joy, author of Why We Eat Pigs, Love Dogs, and Wear Cows, believes that social change—in this case, honoring the intrinsic worth of animals by not eating them—is a complex process requiring both an awakening to the hidden reality of exploitation and the individual will to act upon that awareness. Asking people to stop eating animals, as Joy sees it, is more than asking for a change in behavior; it’s asking for a profound shift in consciousness that people make only when they’re personally ready to do so. Nick Cooney, the author of Change of Heart: What Psychology Can Teach Us About Social Change, agrees. Noting that 80 percent of vegans became vegan gradually, he believes that seemingly minor improvements—say, larger cages—ultimately create pivotal “shifts in self-identity” for both producers and consumers. Individuals who start seeking products from more “humane” producers or participating in “meatless Mondays” are consumers who are on the path toward veganism. Similarly, institutions that embrace (however reluctantly at first) improvements for animals are institutions that, in eventually owning that improvement, come to identify with and become open to even more productive changes for animals. This process, according to Cooney’s research, is exactly how reform plays out on the ground, in the real world. Advocacy that supports “improvements” in animal exploitation is neither “gradualist” nor a “vegan” approach—it is a dead end that will never lead to the end of animal exploitation. … At best and in the unlikely case they are adhered to, so-called “gradualist improvements” only address a fraction of the animals’ experience but do nothing to abate the heinous cruelty they are still subjected to. Hence the strife continues: An organization such as HSUS lobbies, the meat industry kvetches, and the abolitionists howl at them all for unconscionable ethical waffling. Meanwhile, billions of animals continue to suffer the indignities of industrial animal agriculture. As has so often been the case with reform movements in the United States, infighting between those who seek evolution and those who seek revolution fosters more stagnation than progress. Take, for instance, this year’s annual Animal Rights National Conference, which was held in Alexandria, Va., last month. After an abolitionist petition to ban HSUS from the conference failed, abolitionists tried sponsoring an independent seminar in protest of HSUS’s involvement. The hotel where the conference took place then attempted to shut down the abolitionists’ competing seminar (apparently at the main conference organizers’ behest). It’s this dust-up—not any of the myriad practical strategies of reform discussed during the four-day conference—that has earned the bulk of the attention in animal rights circles. In any case, if the movement figures out how to meld these competing approaches to animal advocacy, the meat industry would really have something to complain about. For now, though, as I read the trade literature, it’s hard not to see the industrial producers of animal products as little more than petulant whiners who have no inkling of the real pressure they would face if animal advocates in the United States managed to pull themselves together.